The USDA, which distributes millions in crop subsidies and checks food quality, has issued a solicitation for submachine guns with 30-round capacity in a .40 calibre configuration. The U.S. Department of Agriculture is seeking to buy guns of the sort that are seen on the battlefield rather than a cornfield. A solicitation was issued by the USDA on May 7 to advise the public and government suppliers that the department is seeking "the commercial acquisition of submachine guns [in] .40 Cal. S&W." 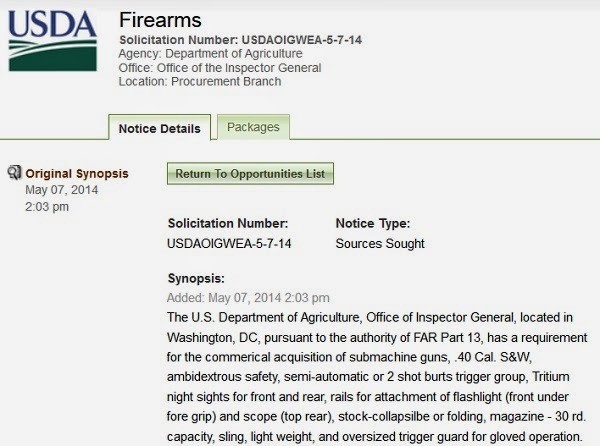 The USDA is seeking submachine guns with "ambidextrous safety, semiautomatic or 2 round [bursts] trigger group, Tritium night sights front and rear, rails for attachment of flashlight (front under fore group) and scope (top rear), stock collapsible or folding," as well as a "30 rd. capacity" magazine. The solicitation also calls for the guns to be lightweight, and each equipped with a sling and an "oversized trigger guard for gloved operation." The solicitation directs "all responsible and/or interested sources...[to] submit their company name, point of contact, and telephone." Suppliers submitting information to the USDA in a "timely" fashion "shall be considered by the agency for contact to determine weapon suitability." Tritium sights are used by the military and law enforcement for nocturnal or low-light operations such as urban warfare. However, they are not the optics systems which provide night vision. The submachine guns being ordered by the USDA are the sort of armaments that President Barack Obama once described as properly belonging "in the hands of soldiers" and not "on the streets of America." A call by Spero News to the USDA revealed that the voice mailbox of Linda Josey, Chief of USDA Procurement Management Branch, was full. The USDA, which was not known to have been so armed, is joining a trail already blazed by the Environmental Protection Agency and the Internal Revenue Service. Last month, it was shown that the Bureau of Land Mangement, in a standoff with a Nevada rancher who owed thousands of dollars in unpaid land-use fees, has recourse to heavily armed paramilitary operators and tactics. The Department of Human Services purchased millions of rounds of ammunition in 2013. “But American over-policing involves far more than the widely reported up-armoring of your local precinct. It's also the way police power has entered the DNA of social policy, turning just about every sphere of American life into a police matter,” concluded Mother Jones. The guns that the USDA now seeks to purchase are class 3 weapons that civilians cannot legally purchase without submitting to extensive background checks and documentation from Alcohol, Tobacco and Firearms – the federal agency charged with enforcing gun-control laws. Among the weapons systems that uses the .40 calibre Smith and Wesson ammunition is the modern SIG MPX, which is manufactured by Sig Sauer – a Swiss corporation that has manufacturing and research facilities in the U.S. 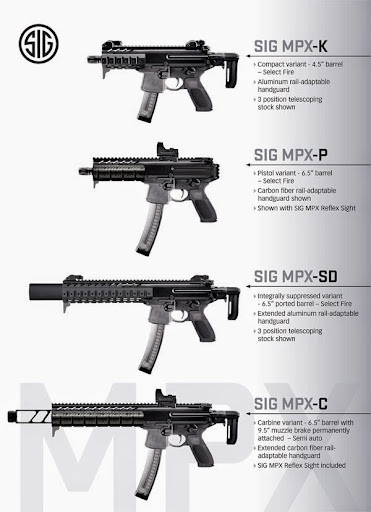 The SIG MPX is described by the company as “the world’s first submachine gun that operates with a fully closed and locked rotating bolt system, greatly enhancing operator safety.” The weapon is the “only submachine gun that allows the operator to change barrel length, caliber and stock configuration in the field to meet mission requirements. Easily convertible to 9mm NATO, .357SIG or .40S&W.” The SIG MPX is available at the retail price of $2,300 per copy, approximately.